Vintage Lorry Funerals: A ‘Tugboat’ prominently displayed in Cwmbran. Vintage Lorry Funerals second funeral in Cwmbran was for a man who started his working life on the Tugboats in Newport Harbour during 1959. Glyn Fisher then progressed to the Merchant Navy and one of his first sailings on the Garthfield involved taking equipment for the new Nuclear Power Station near Snowdon, docking at Porthmadog. The Garthfield was a Coaster and Glyn’s ports of call included Douglas (IOM), Millom (Cumbria), Liverpool and the Clyde. However, family problems about him being away from home for long periods caused Glyn to leave the sea and he became a Lorry Driver. Although Glyn earned his living behind a steering wheel, he missed his time on the sea. He developed a passionate interest in Tugboats partly because Daniel Lynch who had worked with him as a deckhand on the Dunraven was now a Tugmaster, the Captain of a Tugboat that operated along the South Wales coast. Daniel supplied Glyn with Tugboat magazines which he avidly read in his caravan on the coast at Porth Kerry. 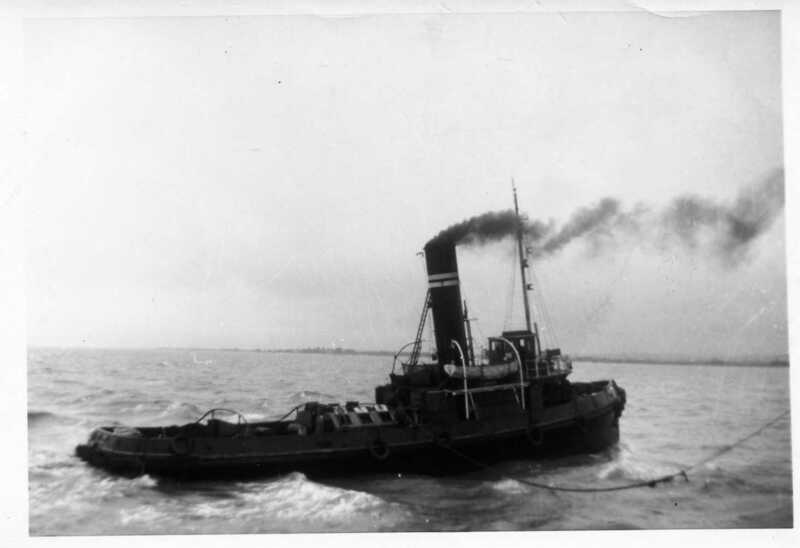 Glyn was also given the opportunities of occasional trips on Tugs pulling ships into Newport with timber and Swansea with iron ore for Port Talbot Steelworks. Sally of Athena Flowers was most helpful and told David that the ‘Tugboat’ would be made from a 2 ft x 2 ft designer board. Given the short lead time for a funeral, David has to make assumptions and create the support structure whilst the Florist is creating the Floral Tributes. The day before the funeral Sally took a picture of the base before it was covered with flowers and emailed the picture that contained dimensions to David, which he used to create a cardboard template. At that point he discovered that one of his assumptions was flawed. The height of the ‘Tugboat’ was half the expected height. The Florist had realistically proportioned the ‘Tugboat’ and used 2 ft x 1 ft as a base, half of the designer board and probably used the balance for another Floral Tribute. David always tries to imagine how a Florist creates a Floral Tribute and he was devastated that he hadn’t guessed the right height. Being brought up in the frugal ‘waste not want not’ 1950’s he should have known that only half of the designer board would have been used. An early start ensured that the vintage lorry was outside Arthur Peake’s Funeral Home by 0715 hours only to find the gates locked. Don Peake knocked on cab door at 0800 hours and advised David that he should park in the Leisure Centre car park just down the road. There was plenty of space at this facility that had been taken over by the local community following recent Government cut backs. By 0830 hours cars were arriving with the occupants wearing heavy boots and woolly hats, obviously hikers. At 0900 hours a gentleman came up to David and said, ‘I never thought they would take my idea up so swiftly.’ Apparently he had recently written to the Leisure Centre suggesting that they should use the vast tarmac area as a revenue stream from events such as vintage vehicle rallies. David said that his vintage vehicle was booked for a funeral with Don Peake, pointing to his yard which backs onto the playing fields associated with the Leisure Centre. Glyn Fisher in his coffin was thought to weigh around 25 stone and some of Don’s staff were concerned about how the coffin would be loaded and offloaded. David was helped by two Bearers on the deck when Glyn was loaded, however, Glyn was offloaded at Gwent Crematorium with David alone on the deck, supported by Bearers on the ground. Glyn’s coffin glided across the deck as if the total weight was 12 stones. The ‘Tugboat’ was photographed from a number of angles and the picture of a ‘Tugboat’ helping an Ocean Going Liner into harbour was sent to Vintage Spirit, Tugboat & OSV and Powerboat & RIB magazines. Space for the Obituary Article was secured in Vintage Spirit and his Daughter felt that her Dad would have been very proud to be featured in such prestigious magazine. David spoke to Daniel Lynch and got more background on Glyn time on the water. Daniel not only filled in some of the details but he made available some amazing pictures, including the ones featured here and David is grateful to Daniel for allowing these pictures to be included. David contacted Sea Breezes magazine and the Editor was delighted to hear from him. There is no doubt that Daniel’s pictures were a major help and Sea Breezes exceeded David’s expectations making almost a whole page available to Glyn Fisher in their magazine and also putting part of the article on the internet. Alison was delighted with all David’s efforts and sent a ‘Thank You’ card with a heartfelt message.